Hokusai was young enough when one of his uncles adopted him with a dream that he will succeed in their family business. His uncle was working as a mirror polisher at that time in the house of the commander in chief. Right from the childhood, he was guided to perform his job perfectly so that he can lead a bright future by establishing a direct contact with the upper-class society. Although he started working with his uncle when he was only 6 years old, with time he developed a different passion towards artwork and ultimately started separating himself from his uncle when he was a teen. When he was 19 years old, he joined studio of Ukiyo-e artist who was popular as Katsukawa Shunsho. The interesting story of Hokusai’s life reveals that he never stayed at one place for a long time. Actually, he was not focused towards cleaning his workplace so he always allows grime and dust to settle down his studio and the by the time when it used to become unbearable he simply shift to other locations. It is believed that he changed his location almost 93 times throughout his lifetime. He also found it quite boring to hold single name for a lifetime so he often changed his name on different artworks. As per literature showing his life history, he changed his name almost 30 times in his life and the final one was “Gakyo Rojin Manji” that means “Old Man Mad about Painting”. One part of the interesting Katsushika Hokusai biography shows that once he was called in the Shogun’s court and asked to display his artistic skills. He simply took a sheet of paper and painted a long blue mark on it. Then he took a chicken’s feet, dipped it into red paint and used it to create a clever riff on the image that ultimately leads an impression like the motif of maple leaves are floating on the Tatsuta River of Japan. His love to artwork has created many other memorable incidents; once in 1804, at a festival, he painted an eye-catching masterpiece of Buddhist Monk that was 180 meters long and it was painted with a broom that was used like a brush by this artist. Hokusai developed some of the most famous artworks of his life when he was above 60 years old. 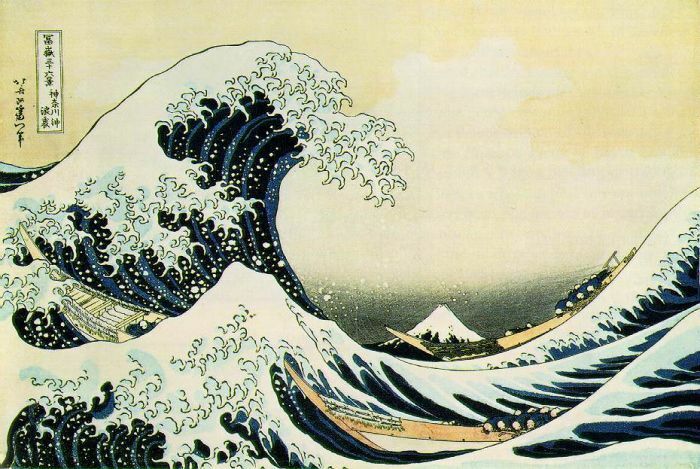 In 1830’s he created the awesome thirty-six page series that is popularly known as Katsushika Hokusai the great wave. Another impressive artwork of this creative mastermind was known as the dream of fisherman’s wife and it is still known worldwide for the impressive idea behind it. His biography says that he began his artwork near 1779 and continued it till his death in 1849 when he was 89 years old. During this long journey, he created almost 30,000 paintings, woodblock prints, sketches and picture books. For so many years, the impressive artwork of Hokusai was restricted within Japan but it came out of the borders in 1850’s and touched the hearts of art lovers throughout the world.